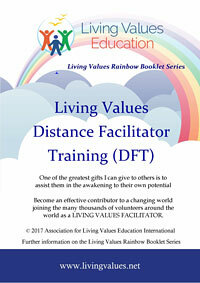 Living Values Education Distance Facilitator Training (DFT) - allowing individuals to have a role in sharing Living Values. 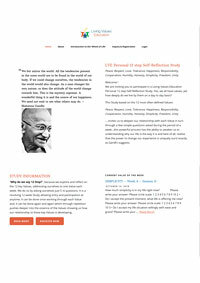 Together with a composite of LV Self reflection and Study Groups the 48 page "Facilitator Training Guide" delivers all the techniques and skills required to feel confident to facilitate activities and workshops using these LVE materials with community groups, schools, families etc. To maintain integrity in LVE delivery method the Distance Programme must provide facilitators of the same quality, knowledge and experience as those who attend the required Living Values Education three training workshops of minimum three days each with a local ALIVE designated trainer. At this stage Distance Facilitator Certification is provided equal to that of those who attend the regular required three, 3 day workshops. 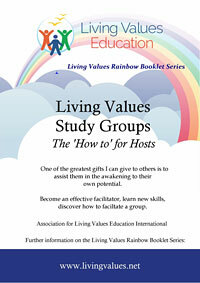 This does allow you to provide Living Values Education activities. Checking weekly participant responses to questions in the 12 week Living Values Self Reflection online programme. Reviewing your personal Journal of the Home Study programme after each value section, including your response to the Evaluation Questions at the end of each Value. (requires weekly submitting by email). On conclusion of Home Study, response to the Evaluation questions in the DFT guide, (requires submitting by email). Through regular email contact between the participant and mentor, there is electronic interaction throughout the 12 week program. 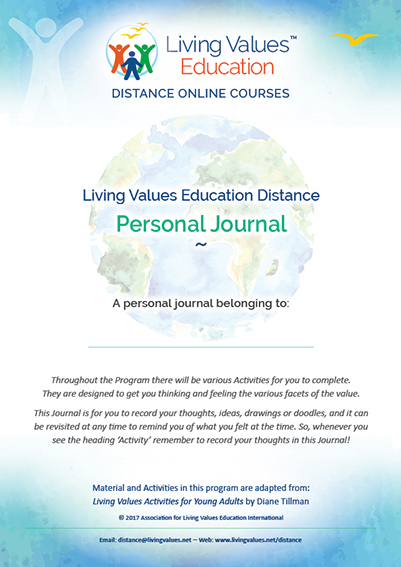 All participants undertake the 12 week Living Values Education Distance Home Study at the same time as participation in the weekly Living Values Education Distance Self Reflection Programme which provides the experience for yourself and to benefit from the change in your own awareness to values. The Distance Facilitator Training Guide can be also engaged during the period. Recommendation: To assist our new Facilitators training we recommend experiencing a group face to face dynamic through the LVE Study Group process whereby the Facilitator brings together a few (4 min -10 max ) friends, family or work colleagues and together experiences the Self Reflection process engaging one value each week in a participant/guide role. The benefit here is to experience, practice and gain confidence is the Facilitator role in a friendly environment. This should not be engaged until after four consecutive weeks of Values have been personally experienced. Communication is between participants and their nominated mentor/moderators (from our experienced DFT list) who assist throughout the 12 weeks. When accredited Distance Faciliatators may choose to go onto full Living Values Education Facilitator Accreditation, attendance and co-facilitation being a requirement at the, 5 day combination workshop and TTT with local Associate or Focal Point after undertaking the Study. This may require travelling to another country to attend this last practical aspect. The combination workshop and TTT days are being held in various parts of the world on an ongoing basis throughout the year. The full Facilitator Training must be completed within one year or the LVE Refresher course must be undertaken. While Free Downloads wll be available, on registering DFT particiants will be sent the required full programme components. 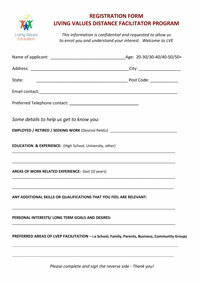 Please fill in and return to us by email, we will then connect you to your national Associate or Focal Point or if not available you work direct with us at ALIVE - Living Values Education Distance. 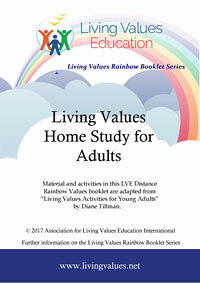 This 48 page Guide delivers all the techniques and skills required to feel confident to facilitate activities and workshops using Living Values Education these materials with community groups, schools, families etc. The Gude provides professional advice, recommendations as to how to be a successful facilitator, something quite different from a teacher, in that a facilitator draws out while a teacher puts in.